Since When Has Contemplative Spirituality Been Reformed Doctrine? Indeed, there are; and this is where we now find ourselves entering a murky and mystical area. Now I’ll show you why I said that; I told you previously, e.g. 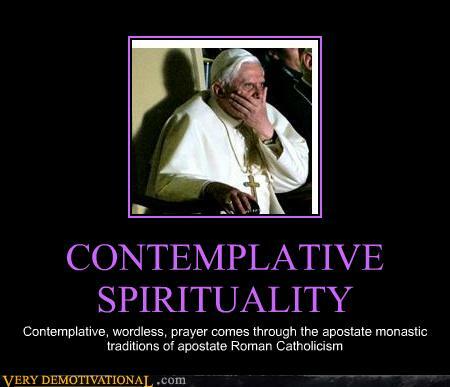 in Contemplative Spirituality/Mysticism Creeps Closer…To Your Church, about a very key component which was hidden within the Trojan Horse of the sinfully ecumenical neo-liberal cult of the Emerging Church aka Emergent Church with its new postmodern form of big tent Progressive Christianity aka Emergence Christianity. Which, by the way, has been pushed at Young Adult and Youth groups within squishy evanjellyfish for years now. What the EC has been doing all along is blurring doctrinal lines through their core doctrine of Contemplative Spirituality/Mysticism (CSM), as taught by Living Spiritual Teacher and Quaker mystic Richard Foster, along with his spiritual twin and Southern Baptist minister Dallas Willard. I’ve also reminded you that as far back as 2004 EC guru Brian McLaren told you that that Foster and Willard were “key mentors” of the EC, and their whole shtick is spreading spurious CSM under the guise of so-called Spiritual Formation, which has now been ongoing for decades within evangelical seminaries. As I was following up a tip from a reader concerning The Village Church (TVC), where New Calvinist Matt Chandler is pastor, I began looking into all of this in Confusion Concerning Calvinist Spirituality? Let me be crystal clear here; I am well aware of pastor Chandler’s current situation with his battling a malignant brain tumor, and of course, I’m praying that the Lord will heal him quickly and completely. And as you’ll see, that aforementioned article was actually written back in April of last year. 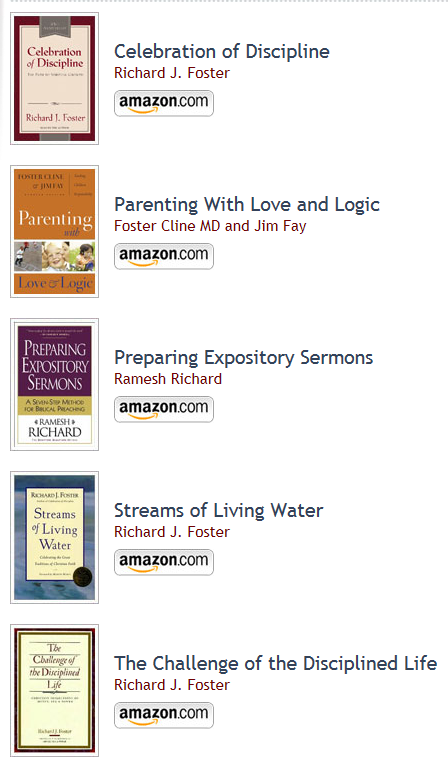 I will say I did find it quite odd that we would find the following books by Richard Foster: Celebration of Discipline, Streams of Living Water and The Challenge of the Disciplined Life. simply want to bathe in the ocean of love God has for his children, while the rest of us seem unfortunately content to experience that love drop by drop. Under that section Meditative Prayer Thomas goes into a short spiel about Ignatius of Loyola, who founded the militantly pro-Roman Catholic Church spiritual Gestapo Unit known as the Jesuits. Thomas though tells that his, “The Spiritual Exercises, helped make mental prayer [i.e. Contemplative/Centering Prayer] more popular.” As you’ll see in Keeping You Apprised Of: Contemplative/Centering Prayer this type of meditation in an altered state of consciousness—a TM-lite sprayed with Christian terminology—was not practiced or taught by Jesus; nor by His Apostles. As it concerns Richard Foster, in his fine book A Time for Departing Christian apologist Ray Yungen is correct in his discussion below concerning the vision that Richard Foster claims to have received directly from God, which Foster shares beginning on page 273 of his SoLF. The Quaker mystic talks about a “deep conviction that…a great new thing is coming.” Incidently, and in fairness, where the Roman Catholic mystic Meister Eckhart’s “great underground river” would include all religions eventually flowing to God, Foster’s own “streams of living waters” do appear to be limited just to so-called “Christian” faith traditions. However, as nice as the idea of these streams coming together may sound, this prophesy flows in direct opposition to Reformation theology and the doctrines of grace that one like Chandler would say he believes. So the question that needs to be examined here is: Why would the staff of a Reformed pastor, who refers to himself as a Calvinist, even want us reading a likely unregenerate—and unquestionably sinfully ecumenical—Quaker mystic to learn about Christian spirituality? A man whose own Christian doctrine is so watered-down and nebulous that he has been included in the Living Spiritual Teachers Project right alongside New Age mystics like Deepak Chopra and Marianne Williamson. Then there’s three books by Philip Yancey who’s rather semi-pelagian with touches of Open Theism, at best. I’ll tell you in no uncertain terms, as a pastor-teacher myself, there’s absolutely no way I would willingly expose my sheep to any of those authors. People only have so much time to read and there’s far better out there. This kind of thing by The Village Church staff only serves to make faded lines even more blurry within Reformed circles. And I am also aware of the caveat: The Village may not necessarily endorse or believe all that is written in these books. The problem is, we’re left to wonder: Which parts are not necessarily endorsed of believed? 1. Gary Thomas, Sacred Pathways [Grand Rapids: Zondervan, 2000], 182. 2. Ray Yungen, A Time of Departing [Silverton: Lighthouse Trails Publishing, 2002], 130. Matt Chandler on being a reformed charismatic without much of a seatbelt from Adrian Warnock on Vimeo.